You probably have everything you need at home to do simple sous vide – except maybe a cheap temperature controller. For less than $30, you can turn your crockpot into sous vide machine! I hate cooking roast venison (or even beef for that matter). As a roast in the oven that is. I always overcook them. Or they end up as flavorless blobs of meat. I know, that’s why gravy was invented. It’s really a matter of more practice, but you know how it goes – if something doesn’t come easy, you resist it and fall back to what you KNOW will work (ie: can do easily and not have to actually LEARN). I’ve been hearing more and more about cooking using a method called “sous vide”. It seemed to be a promising way to consistently cook a steak or roast to the perfect temperature. Easily. SIGN. ME. UP. Yes, I am the type of person who will try something totally off the wall rather than try to learn the “right” way to do something I’ve failed at. And proud of it! 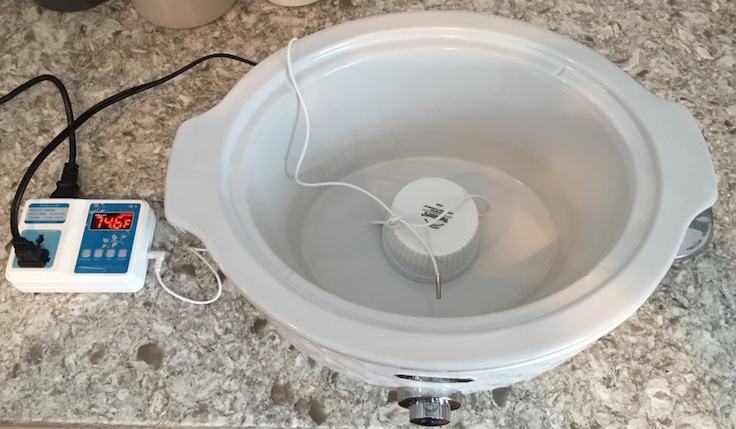 You don’t need a lot of fancy equipment to cook sous vide – an inexpensive temperature control relay can turn your crockpot into a sous vide machine. 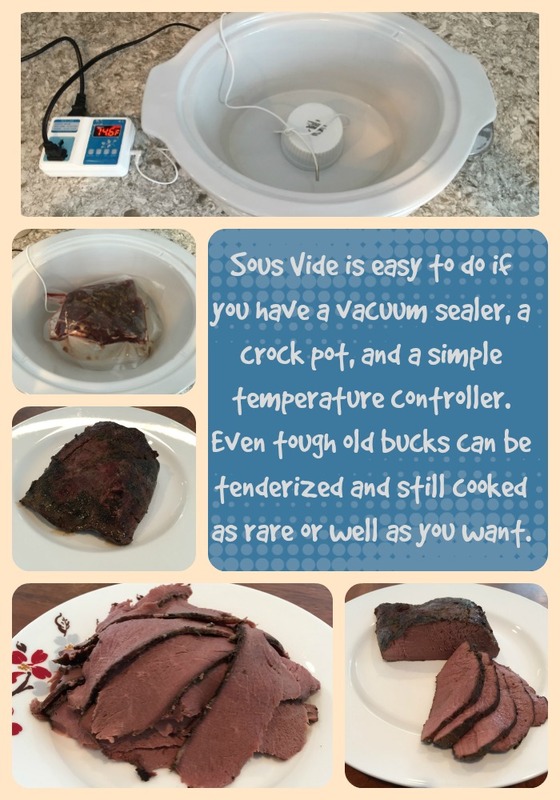 Sous vide is a method of cooking that involves vacuum sealing your cut of meat, and cooking it in a water bath at the exact temperature you want the meat to be, for an extended period of time. The beauty of this is that you could cook a roast for a week, and it wouldn’t be overdone. 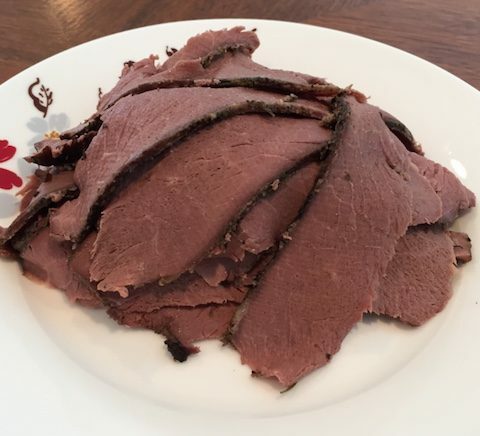 Not technically anyways – don’t cook your roasts for a week. The down side of sous vide cooking is it typically involves fancy equipment to heat and circulate the water. Now anytime fancy equipment is involved, people being as clever as they are, always find cheaper ways to do it. 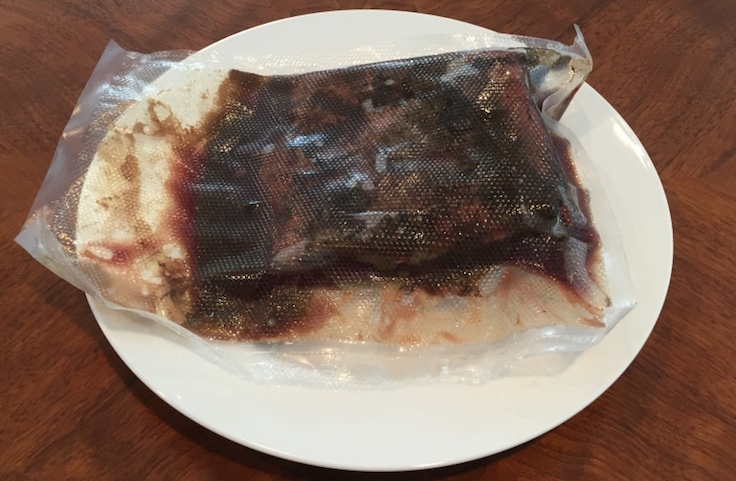 With sous vide, you could simply use a ziplock bag, a pot of water on the stove, and a thermometer. YOU then become the fancy controller maintaining the perfect temperature. No fun. Another method I’ve seen involves using a cooler. Heat water to the temperature you want, and fill the color and submerge your bagged meat. This would work well for shorter cook times (several hours), but you’d still have to add/change water for longer cooking times. I read about using a thermostatic relay to control your crockpot as a water heating device. I liked that idea, so I gave it a try. 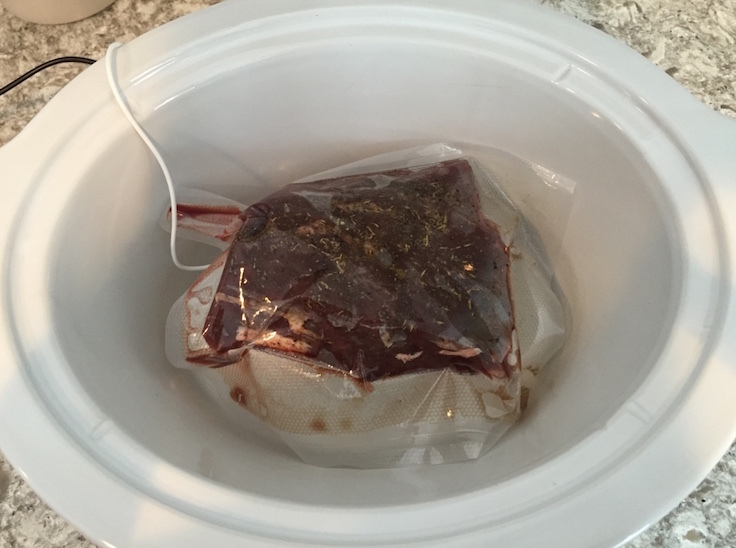 Your vacuum sealed roast should be off the bottom of the crockpot. Amazon carries a little unit for about $30 made by Willhi. It can control a device to maintain a temperature from -4° to 220° F. With this range it can double duty controlling a fridge for making charcuterie. I’ve used this guy a few times now, and I really like it. By default, what it does is turn on your device (our crockpot) when the temperature reads 1° below your set temp. Then it will turn your device off once it reads 1° above the set temp. For this to work, you need a crockpot that has a knob to set the temperature (like this one). Digital crockpots usually reset when they get plugged in. This controller is basically plugging in/unplugging your crockpot to control the temperature, so digital crockpots won’t work. Make sure you save the juice from the bag so you can have your roast venison sandwich au jus! You can’t cook super huge roasts this way in your crockpot. The roast above is a 2 lb section from a top round roast. It ran about 2 inches at it’s thickest point, which is just about perfect for my crockpot. Use this method to cook any kind of non-marbled cut, from loins to rounds. Top and bottom rounds probably benefit the most, and that’s what I normally will use if I cook sous vide. They are usually too long though, so I’ll cut it to a length to fit my crockpot, and use the rest for another meal (like venison pot pie!). Shoulder blade steaks would work too, but other shoulder or neck cuts have too much connective tissue, they just won’t look as nice when you thin slice them.. Doing a quick pan sear of your finished roast will add a little flavor and give a nice blackened appearance. Put a pot of water on the stove, with enough water to fill your crockpot. You need to preheat the water before adding it to the crockpot. Take your roast, and give it a light coat of olive oil. I like to put a rub on the outside of salt, pepper, garlic powder, and a little thyme. Nothing fancy, I just sprinkle these on and rub them in. Go light on the thyme – I really like the flavor it adds, but I find it intensifies as the meat cools (ie: used in sandwiches). Put something in the bottom of the crockpot to keep the meat from getting in direct contact with it. You want the meat to be surrounded by water, top bottom and sides. I’ll tie the temperature sensor around a tiny bowl in a way that the probe will also be surrounded by water – you don’t want that to contact the crockpot directly either. Place the bagged meat on this setup. Use a thermometer and get your pot of water to the exact temperature you are shooting for. If the water got too hot, add some tap water. Once it’s the right temp, fill the crockpot – or at least make sure your roast is thoroughly covered. Let’s talk temperatures for a minute. The cooking temperature will be swing within a certain range, so when you first try this pay attention to how your crockpot operates. 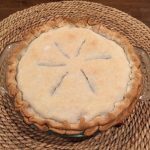 Mine swung 4 degrees – I set the Willhi for 138°. When then temp got to 137°, it kicked on. The temperature continued to drop to about 136° before the temp started rising again. Crockpots aren’t exactly precision devices… When the water hit 139°, it cut off the power. 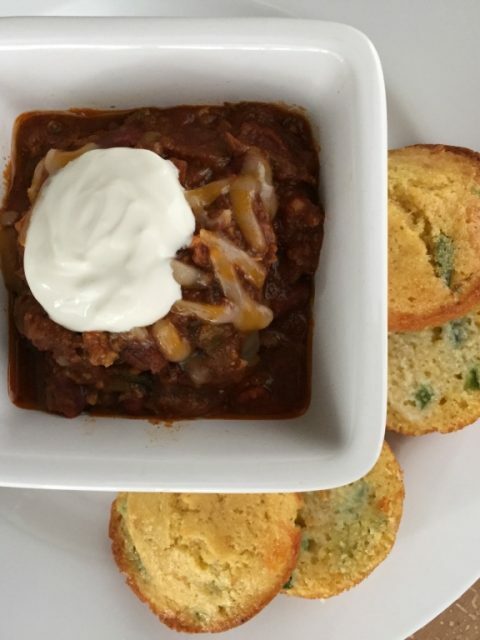 The temperature continued up to 140° before it started dropping – so now I know what my max temp will be – and I consider this the true cooking temperature. 140° is getting to more of a medium/borderline medium rare. 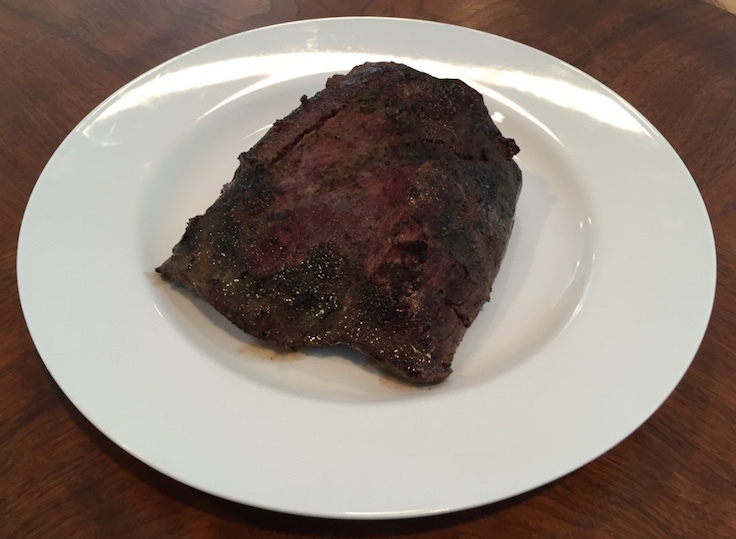 Medium rare is usually the target you are shooting for with venison, so if that’s what you are after, know how your crockpot swings and set the thermostat accordingly. 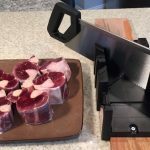 Still don’t have a slicer? How are you going to make thin shaved roast venison then?! Now for time… the longer you cook it, the more tender it will get. It can never truly be overdone as it will never reach a temperature higher then what you set. HOWEVER. Yes there is ALWAYS a however…the longer you cook it, the more juice will leave the meat. So it CAN dry out, but you’ll have lot’s of juice for gravy or au jus. Also, the longer you cook it, the more tender it will get. So it can turn to mush too. What is the right amount of time? This eventually comes down to personal preference, but I find 24 hours is a great starting point. Setting the controller to 136° and letting it go for a day nets me a perfect medium rare throughout the roast with amazing tenderness, yet still holds together enough to run through the slicer. If you use a more tender cut, you’ll need less time. When it’s done with the bath, I like to pan sear the roast in butter on high heat for just a few minutes per side. This gives it a nice browned/blackened crust – but don’t sear it for too long. You don’t want to cook the inside any further. Let it cool, then run it through your slicer. SAVE THE JUICE. When you go to make your sandwiches, heat the juice up in a pan. 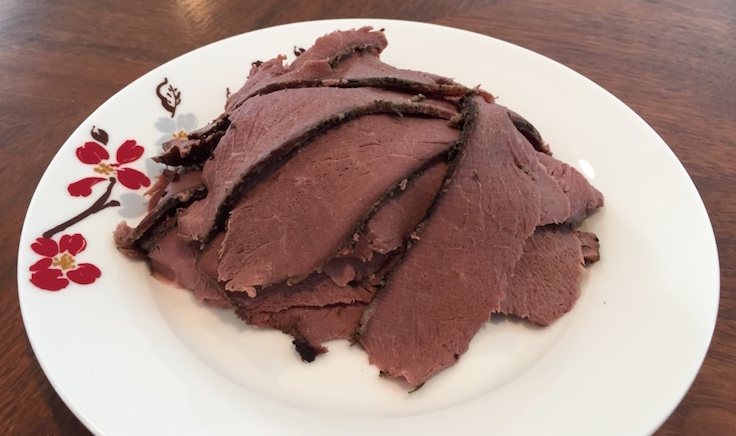 Briefly dip the slices of meat in the heated au jus, and throw on a bun with some horseradish sauce and some cheese for a melt in your mouth roast venison sandwich that will rival anything you can get from a deli.